Connect with home enthusiasts and furniture shoppers. You have a lot to say about your brand, more than a flyer or 30 second ad can convey. 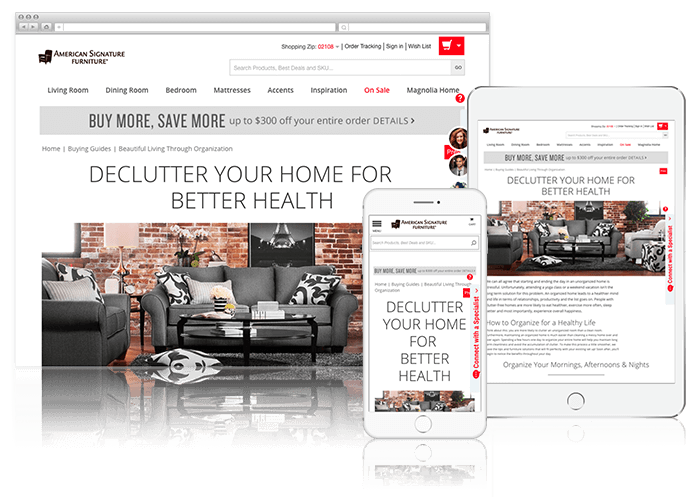 Digital content allows you to talk to shoppers and home furnishing enthusiasts about helping them furnish the home of your dreams. We write content to engage shoppers at different points in the purchase path, whether it’s the newest styles and colors or explaining what to look for when purchasing a dining room table. Write engaging content that communicates your brand purpose. The challenge for furniture retailers is how to stay in front of shoppers in the sometimes long gaps between purchases. We create content for blogs and content hubs that engages with home furnishing enthusiasts. With an effective digital content strategy you can communicate your brand and build loyalty before a shopper even looks at a product page. Communicate relevant and objective information to shoppers on your site. Buying guides help play the role of your sales team, providing expertise and answers to shoppers considering a purchase. We research the questions that shoppers have then guide them to make the best decision for their furniture need. We combine content with high quality graphic design to effectively communicate to your target audiences, usingimagery and layouts to provide useful and relevant information to your audience. From banners to landing pages, we ensure your brand looks its best and is consistent with your stores and offline marketing.